From Core77 website: "Many packaging designers have broken their heads on getting a spoon integrated in the pack to support our 'on the go' lifestyles. The industrial design company Inveratek now launched an interesting alternative, whether you eat with or without spoon, it's up to you - which is probably the best of it all. It can be manufactured on existing form ll seal or pre-forming equipment and requires no special tooling or materials. In fact CrushPak's unique design means less plastic can be used than a conventional container, up to 36% less. 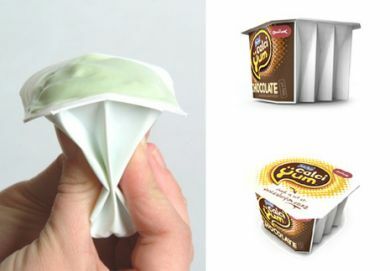 Fonterra (their New Zealand licensee) is currently surprising the locals with this packaging innovation. Inveratek also licenses major manufacturers in US and Europe, so probably coming soon to a supermarket near you."